Mat-Su Regional Acquires Latest Robotic Surgical Tools — The People's Paper & Make A Scene! In late November, Mat-Su Regional Medical Center added the newest model of the da Vinci Surgical Systems to its fleet of surgical tools. The latest da Vinci – the Xi – differs from its predecessor, da Vinci Si, mainly in terms of ease of positioning, according to Dr. Shannon Gulley from Glacier Surgical Associates. Gulley has been working with the da Vinci Si for about four years and uses the tool mainly for hernia removal. For her, the most beneficial aspect of the technology is how she can perform intricate procedures. The new da Vinci Xi is even more versatile and intuitive. Generally speaking, surgeons control the robotic arms of the da Vinci while looking through a viewing screen at a console, using the instruments almost like extensions of their hands. The da Vinci system gets its name from inventor, artist and scientist Leonardo da Vinci, according to the manufacturer. Among his many scholarly pursuits, da Vinci was also a student of human anatomy. Robotics surgery has been gaining in popularity in recent years due to its positive impact on patient recovery. The da Vinci excels at non-invasive surgery by allowing surgeons to use smaller incisions, thus leading to less blood loss and faster recovery time. Dr. Jeff Simerville, board-certified urologist with Alaska Urology, explained that the advanced technology creates a better patient experience when compared to traditional surgical methods. “The outcomes are similar, but the patient experience is much better,” he said. 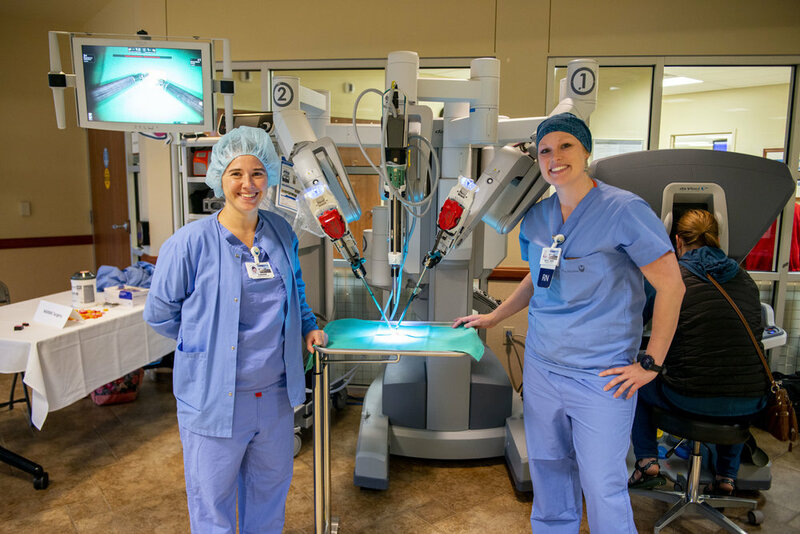 Simerville began using the robot in 2011 for urologic surgeries, but since its clearance by the FDA in 2000, the da Vinci has been used for gynecological procedures, prostate removal, cancer surgeries, colon removal, general surgeries, kidney removal and lung surgery. “Anything you can do laparoscopically you can do with the robot, but most surgeons use it for probably hernias, colons, gallbladders,” Gulley said. Operations using the da Vinci can technically be performed from anywhere in the world, however the control box is usually located in the room right next to the patient. Some patients have been misinformed that the robot actually controls itself during surgery, according to Gulley. However, the robot is a tool used and guided by human hands, although it does simultaneously minimize human error, such as trembling. Mat-Su Regional Medical Center is a member of the Mayo Clinic Care Network. It is a 74-bed acute care facility providing advanced surgical service, including robotics, cardiac care, emergency services, diagnostic imaging, sleep studies, three urgent care centers, the Family Birthing Center and is home of the 30-Minutes-or-Less ER Service Pledge.